As we all know, some of life’s most pleasant experiences can be surprisingly brief…or is that just me? 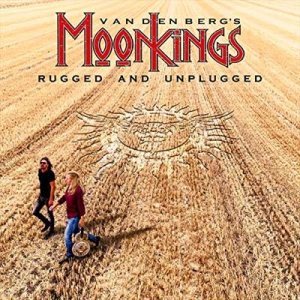 Take, for example, this new release from Adrian Vandenberg and vocalist Jan Hoving. A career overview painted in the most minimal of brush strokes, just one voice and an acoustic guitar, strumming songs of luuuurve. At just 8 tracks, including one brief instrumental, it nestles somewhere between long EP and mini album. But good things come in small packages. Recorded at Vandenbergs home studio and Hoving’s farm, this is, as the cover art suggests, a warm, rustic, autumnal thing – shorn of bombast and theatrics, it focusses on ballads and songwriting. So, in keeping with the overall mood, we’ll keep this short. ‘What Doesn’t Kill You’ is intimate and stripped down, Hoving’s robust vocals are slightly too rock for the setting. Things then calm down and hit a groove, Vandenbergs fingers slide audibly across steel guitar strings as ‘Sailing Ships’ unfolds. The pervading mood is definitely one of mellow reflection. The folky ‘Out Of Reach’ has echoes of acoustic Zeppelin before gentle drums and strings appear around the acoustic slide and things get increasingly (but still quietly) epic. And on we schoomze. Guitars segue from folk to flamenco to blues to classical (quietly) while Hoving’s rockisms (multiple ‘baby, baby’s and rock school 101 clichés) sound slightly incongruous in this gentle setting. But it still works if you’re in the mood…a mood which is very much ‘glass of wine and a log fire’. Perhaps a spot of invention and variety was required to set these songs apart, they lack a bit of individual identity without any amplified pyrotechnics, but, having said that, this is…nice. And possibly just what you’ll need amid the oncoming Christmas chaos.